Emperor Ping: It has been 25 years. I thought that I would never see you again. Emperor Ping: [grabs Mrs. Jiang] And you married the Imperial Doctor! Q: Was this film made in Chongqing City? Zhang Yimou was a very highly regarded filmmaker 5 years ago, before I had ever heard of him. Then he earned a place in my heart by directing both Hero and House of Flying Daggers. With those last two I felt like I was in martial arts movie heaven, so I would instantly be interested in any other future films that could approach those two in scope, talent, and action. 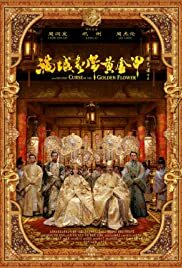 Curse of the Golden Flower focuses mostly on the first two of those three traits, but besides, anything starring Chow Yun-Fat will earn my attention like a bullet to the head. I do own The Corrupter after all. 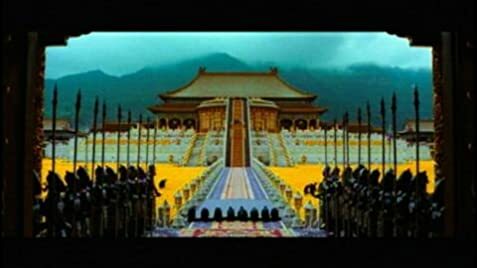 This is a film about a royal family, rather dysfunctional at that, in the 928 AD Tang Dynasty. Chow Yun-Fat is Emperor Ping, who from the way he handles his family and can anticipate any kind of attack or counterattack seems like quite the ruthless warlord. He has three sons: one is a teenager, who isn't given much regard but knows more than others think. The eldest of the three is the current crown prince, but doesn't seem to have any special talents, other than drawing the affections of the wrong women. The middle son is a great warrior and, of course, is now the favorite of the father. But these characters may be just pawns to Empress Phoenix (Gong Li), who is mother to the younger two brothers and step-mother to the eldest. Under normal circumstances she might be a great mother, wife, and Empress, but current circumstances, including a mystery illness, have forced her to take actions involving a secret plot to remove her husband from the throne. This is not the action movie some might expect, though there is enough near the end to earn the R rating. It's basically a family drama, though in a rather fascinating and different setting for such a story. As you'd expect with a royal family, appearances are everything. Anything out of the ordinary has to happen in secret. All the normal everyday stuff is almost mechanical in nature. Whether you see dozens of servants getting up in the morning, or preparing food, or planting flowers, it all occurs in such a fiercely coordinated fashion. It would have been such a hard life, either being a royal or supporting one, but it would be a miserable life if one couldn't take any pride in what they did. The filmmakers who designed and implemented all the sets and costumes should take a hell of a lot of pride in what they do. The family of this story, even while destroying themselves (and therefore their empire) from within, are living in the most lavish accommodations and outfits I've ever seen. I usually don't think much of costuming or set design, but I must say that after seeing Chow Yun-Fat's golden suit of armor, or anything Gong Li was in, or the design of their personal quarters, I really hope for some Oscar recognition. Perhaps the best I've ever seen in those areas. Overall though, a good film, and a definite must for any Chow Yun-Fat fan to seem him play such a great villain, as with Sammo Hung in Sha Po Lang. It kept me interested throughout, but nothing too surprising happened in regards to story. It basically all went how I imagined it would.